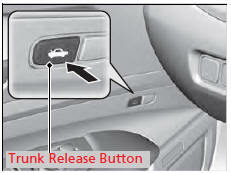 Pressing the trunk release button on the driver’s door. 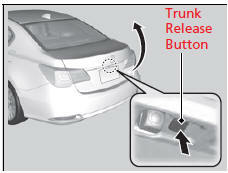 Even if the trunk is locked, you can open the trunk if you carry the keyless access remote. • A person who is not carrying the keyless access remote can unlock the trunk if a person who is carrying it is within range. • Do not leave the keyless access remote inside the trunk and close the lid. The beeper sounds and the trunk cannot be closed.